It’s been a week since streaming media giant Netflix announced two big agreements which signal the company is aggressively moving into a space once occupied exclusively by motion picture distributors and exhibitors. One calls for a sequel to the martial arts classic “Crouching Tiger, Hidden Dragon” to be released next August day-and-date on Netflix and in select IMAX theatres. The other sees Netflix enter into a deal with actor Adam Sandler to finance and distribute four feature films. In their pieces on the announcements journalists used phrases such as “landmark”, “game changer” and “paradigm shift” so often the words lost all meaning. A week later, it turns out the sun still rises in the east and sets in the west, North American movie theatres were just as crowded as ever over the weekend and cinema goers still gobbled up popcorn while watching the latest releases. This is not to say Netflix’s moves weren’t noteworthy or significant, but rather that the pots of ink (both virtual and otherwise) spilled covering the news were, more often than not, used to write overblown treatises filled with hyperbolic predictions of the industry’s demise crafted primarily to play on the fears of those who depended on it for their livelihoods. Now that everyone’s initial excitement has died down we hope to bring some sanity back into the conversation by examining a few often overlooked concepts. Before last week, how many of you actually knew that a sequel was being made to “Crouching Tiger, Hidden Dragon”? After last week’s Netflix news, you can more than triple the number of people who know about the movie, and that’s being extremely conservative. Mainstream media had hitherto paid little notice of the sequel being made to a fourteen-year-old Chinese-language film. Sure, “Crouching Tiger, Hidden Dragon” was a blockbuster when it was released in 2000; the first foreign language film in the United States to earn more than USD $100 million and for years was the country’s highest grossing foreign language movie of all-time. The movie was also nominated for ten Oscars, the most Academy Award nominations ever received for a foreign language film, a record the film still holds. “Crouching Tiger” went on to win four trophies including Best Foreign Language Film and it served to jump-start the career of director Ang Lee, who was already a well respected helmer. When it comes to the sequel none of that matters however, in part because so many of the elements which made the original “Crouching Tiger” film a success are missing. Stars Yun-Fat Chow and Ziyi Zhang are missing, leaving Michelle Yeoh as one of the few returning cast members. The screenwriters, including James Schamus, are absent as well. Perhaps most importantly, Ang Lee will not be directing. Instead, Woo-ping Yuen has been tapped to direct the sequel being penned by John Fusco. Arguably an incredibly influential figure of the Hong Kong action genre, Yuen has only made one film in the past 20 years; “True Legend” in 2010 which cost RMB ¥122.6 million (USD $20 million) to make and only made RMB ¥46.5 million (USD $6.82 million). He has been working predominantly as a fight choreographer for movie such as “Kill Bill: Vol. 2”. To be sure Yuen may be a fine and capable director, though currently is a bit of an open question due to his limited creative output in recent years. So too then is the quality of “Crouching Tiger, Hidden Dragon: The Green Legend” itself. When Netflix first announced they would finance and open the film it raised speculation that the sequel may not actually be any good. Realizing this, the movie’s distributor, The Weinstein Company, may have been trying to lay off some of their risk on the production, if not entirely recoup their expenditure, by selling Netflix the rights to distribute it. It’s not hard to believe the “Crouching Tiger” sequel could head straight to home video in the United States. Even if the film is a smash hit in its native China (which it likely will be), whether the Weinsteins would distribute the movie theatrically in the U.S., and how they would go about doing so, is certainly open for discussion. This past summer they hampered the release of “Snowpiercer”, a Korean blockbuster that received solid reviews and decent box office, by letting iTunes sell it after only three weeks in cinemas. Despite the pedigree of the first “Crouching Tiger”, there is no guarantee without the original creatives that North American audiences will return after 15-years in the same numbers to see what is essentially a Mandarin language martial arts movie. Capturing lightning in a bottle more than once is difficult. According to many industry analysts the day-and-date release of “Crouching Tiger 2” on both Netflix and in theatres via IMAX illustrates the collapse of theatrical release windows. Yet if the film were going to head straight to home video anyway it wouldn’t have had a theatrical release window to begin with. Thus, the pronouncement that this deal is a prophecy of future release windows is inaccurate. The same could be said of The Weinstein Company’s attempt to distribute the “Crouching Tiger 2” theatrically via IMAX. Currently no major cinema chain has agreed to play the movie if it is released on home video day-and-date. This includes North American circuits such as AMC, Cinemark, Regal and Carmike as well as the likes of Cineplex in Canada and Cineworld in Europe. This raises the proverbial question of whether a tree falling in the forrest makes a sound should nobody be around to hear it. If a movie is released in theatres and on home video day-and-date and exhibitors don’t show it in their cinemas nor were planning to program it all that widely, was the theatrical release window for that specific film broken, or did it never really exist in the first place? Such queries only manage to generate additional questions. If IMAX knew their exhibitor partners were going to balk at showing the sequel to “Crouching Tiger” should it be available on Netflix day-and-date, why bother participating in the deal at all? Why not just let Netflix have it exclusively? The answer is straightforward and can be summed up in one word; China. Imax screens only account for one per cent (1%) of the total Mainland screen count but an astonishing ten per cent (10%) of the box office, according to an interview with Imax’s director in China Yuan Hong. “Crouching Tiger 2” will likely earn a majority of its theatrical revenue in China, a territory where IMAX is looking to increase its screen count and where Netflix does not exist. This makes IMAX decision a no brainer even if they had decided not to show the film theatrically in any other territory. Indeed, politically it may have been wiser to agree to such terms upfront, signaling to exhibitors in other territories that this was a play for China only and not in regions where the sequel would be available on Netflix. It’s hard to fault IMAX though for attempting an alternative approach to distribution, even if it’s one fraught with obstacles. That brings us to the four-picture deal Netflix signed with Adam Sandler, a comedic actor whose films are generally quite profitable – save for duds like “Jacke and Jill”, “That My Boy” and this year’s “Blended”. For the past 15 years Sandler and his company Happy Madison Productions called Sony Pictures Entertainment home. During that time they made 25 films together, most of them hits such as the “Grown Ups” franchise. Why would Sandler want to give up a cushy deal with Sony, where he sees his films get released both theatrically and on home video, for an agreement that will see his movies reach only one of these distribution channels? The are actually many reasons, each of which worthy of their own dissertation. The success of Sandler’s films have become less predictable in recent years a trend which may worsen as the 48-year-old actor’s frequently juvenile schtick becomes harder to pull off. Meanwhile, the price tag on Sandler’s films has risen over time, in no small part due to his own salary. Studios are making fewer films and lately only seem to be compelled to greenlight big budget franchise movies based on well-known source material. Sandler’s movies, on the other hand, are often medium budget comedies with limited sequel potential. Exactly the kinds of projects studios are presently avoiding. This might be why Sandler has been struggling to setup movies. For instance, Warner Bros. recently put a Sandler film titled “The Ridiculous Six” into turnaround, though that decision may have less to do with Sandler and more to do with not wanting to make a comedy western. 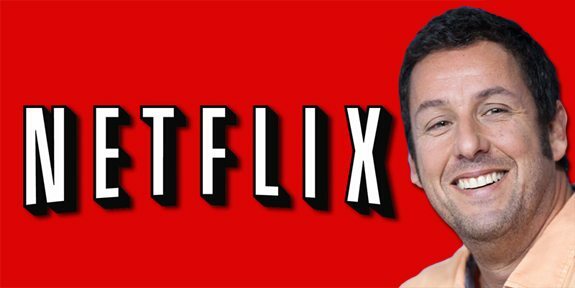 By signing with Netflix Sandler gives up the worry of having to find a home for each new project and gains the assurance he can continue to make movies at a certain level – possibly ones where maximizing profit doesn’t drive the content. And since Netflix doesn’t release viewership metrics for specific content, he won’t have to deal with the stigma of being in a flop. That isn’t to say Sandler is done with studios altogether, especially Sony. The actor headlines next summers “Pixel” as well as a sequel to “Hotel Transylvania” for the studio and there is talk of a third installment of the “Grown Ups” franchise. The biggest winner out of all this news is Netflix. Not the least of which is because all of this is “news” in the first place. The company could even consider part of the financial outlay for these deals as a marketing expense. Every media outlet whether online or off, print or digital, wrote about the announcements at length last week. Many continued to do so this week as well. Each article and every post was a subliminal marketing message telling the public that Netflix was the market leader in providing streaming video content of all kinds. Existing Netflix subscribers were reminded just how great the service is and how much better it is going to be with even more exclusive content. Potential subscribers were informed that if you want hip exclusive content like the next four Adam Sandler movies than there is only one place to go… and it ain’t HBO. If part of activating potential customers is getting your name in front of them in a positive light, then Netflix hit a grand slam. Will anyone actually watch all this original content on Netflix? Who cares. If the company is able to get 10% of their current 50 million worldwide subscribers to watch the “Crouching Tiger” sequel in the first month it would be the equivalent of earning roughly USD $37.5 million at the box office (with an average ticket price of USD $7.50). But here’s the thing; once signed up for Netflix a new customer is unlikely to cancel their subscription. Netflix knows this to be true because as a data driven company they are precisely aware of their customer “churn” rate – which is believed to be a low 7%. They are also quite knowledgable about their customer demographics and viewing patterns. Before entering into either of the announced deals Netflix was able to conduct due diligence using their own internal analytics. They were able to quantify just how popular Adam Sandler movies are with subscribers, how many times “Crouching Tiger, Hidden Dragon” has been viewed and by whom and whether their customer’s appreciate martial arts action movies. As Netflix continues to grow internationally and enter new markets they have a growing need to obtain content, exclusive or otherwise, that will appeal to a global subscriber base. 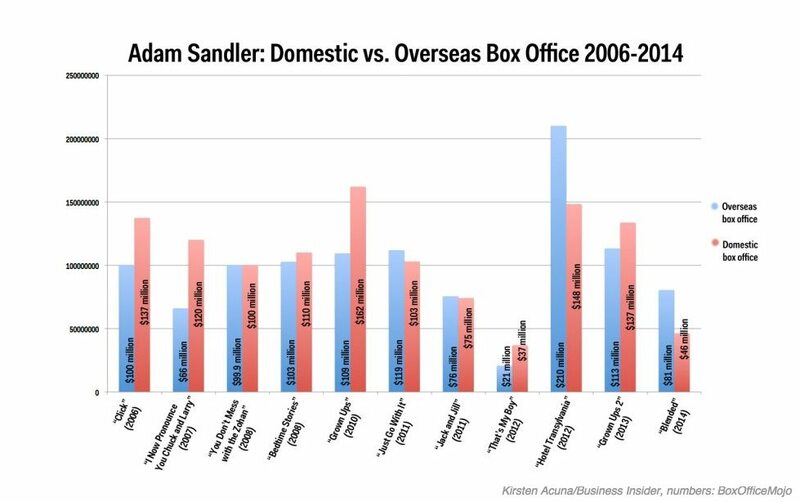 “Crouching Tiger 2” is self-explanatory in that regard and Sandler’s movies have been tracking upwards overseas, sometimes earning more internationally than in North America. When quoted in official press reports analysts and industry insiders could only find one downside to the deals; Netflix would have to market their original content in the same way studios and networks must when opening or airing new productions. While true, Netflix can once again can use such efforts to reach new customers. Marketing to existing subscribers is made extremely easy since the company can promote original content on the main page of their streaming library when any of their 50 million users (36 million in the United States) log in. At a minimum the company could notify subscribers via email. Suffice to say, if you’re a Netflix subscriber, you’ll know exactly when the “Crouching Tiger” sequel or the first Sandler feature is debuting. In reality, what companies such as The Weinstein Company and talent like Adam Sandler are discovering is one more distribution channel to monetize their productions. Over the last decade when studios began to limit the number of movies they made each year, regularly hiring the same small group of actors, writers and directors, the broader creative market found employment in television. Networks loved getting talent that once worked exclusively on feature films and the creatives realized just how artistically rewarding working in television can be. The end result is we are now living through what many have referred to as a golden age of television, and we wound up with shows like “The Sopranos”, “Mad Men” and “Breaking Bad”. Just as television became a willing customer for talent and material, Netflix and similar services have entered the ranks of potential buyers for talent, material, and content of all kinds. Rather than a “game changer” these moves by Netflix are more of a “game expander”. Likewise, these deals don’t signal a “paradigm shift” so much as a nudge of the paradigm as it currently exists. Provided exhibitors maintain their boycott on showing the “Crouching Tiger” sequel next summer, or any movie that opens day-and-date on home video, than theatrical release windows haven’t been broken. However, this development should be seen as one of the loudest knocks on such windows and are a clear indication that historic distribution strategies will be changing sooner rather than later. In other words, while the theatrical release window stayed intact on this occasion, relevant stakeholders have demonstrated their interest in reviewing their options. What few industry pundits have pointed out is most of the original content for which Netflix has won so much acclaim and attention features talent that made their name and gained a fan base through their work on the big screen. Sandler didn’t build the following that makes him attractive to Netflix by starring in short films on YouTube. And would “House of Cards” received any attention without the participation of director David Fincher and Academy Award winning actor Kevin Spacey? To paraphrase Mr. Greenfield’s, talent may one day want to be exclusively on Netflix, but for the time being still wouldn’t mind being on the big screen. Not that new media isn’t capable of eventually becoming as influential as a theatrical motion picture in birthing popular movie stars or celebrities. Especially for a younger generation. Just look at PewDiePie. And if you don’t know who Jessi Smiles and Curtis Lepore are then you are also unaware how the standard for what garners attention from mass audiences can change in as little as six seconds.